On some recent climby training rides, especially when feeling effects of accumulated fatigue, I found myself wishing for a lower granny gear. I’ve been riding a 28/42 crankset + 11-36 cassette. 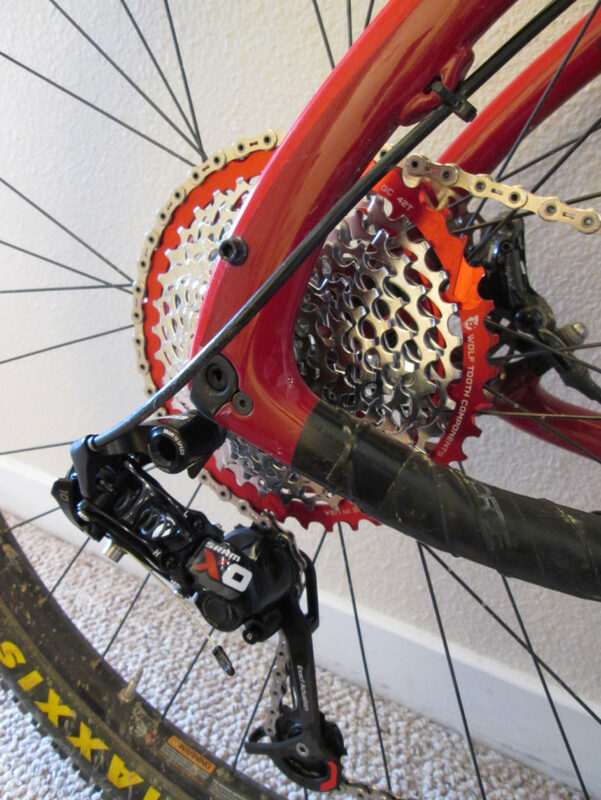 With a 2.2×29″ tire, that’s roughly 22.5 gear inch granny gear (and 110.3 gear inches on the high end). I’ve been riding this for a while now and it’s been fine for normal, unloaded riding. Throw in back-to-back long/climby days and 20+ lbs of gear, water, food, and trying to ride at a more sustainable “all day” pace – a lower granny gear would be nice. Back in 2015 when I trained for the TD I was running a 1×11 with a 30-42 granny – 20.6 gear inches. I never considered that granny gear to be inadequate, but I didn’t like how I spun out almost any gradual descent. The high-end was a meager 86.7 gear inches. Replace the 28/42 chainrings with 26/39. That would change the gear inch range to 20.9 – 102.5. A granny gear 7% lower than previously. Keep the 28/42 chainrings and add a 42T Wolftooth cog to the cassette. Gear inch range: 19.3 – 110.3. A granny gear 14% lower than previously. I opted for #2 and installed it last night. It offers a lower granny gear without sacrificing the upper range. Because we’re adding a new granny gear, a different cog must be removed – typically the 15T or 17T. The downside is that it introduces a larger jump between gears: 11-13-17-19-22 or 11-13-15-19-22. Of course, Wolftooth thought of a solution for this: replace the 15T and 17T with a 16T cog. So the stack looks like 11-13-16-19-22. Two 3T jumps jumps instead of a 2T and 4T jump. And here it is, in red of course. Very nice looking! In the work stand everything sounds and works fine. For the first time ever, I actually had to add links (just one) to a new chain for it to be the proper size. We’ll see how it works in the field soon enough. Mental notes to myself: how noticeable the lower granny gear is? Has shifting crispness has changed at all? Are the jumps between the 13-16-19 cogs more jarring? While on the topic of gear inches, I just had to figure out my granny gear of the commuter bike I rode on the Great Divide in 2010. 28/38/48 crankset + 11-32 cassette with 2.2×26″ tires: 23.1 gear inch granny gear. So slightly harder than the cutthroat’s 28/36 granny. Considering I had never ridden in mountains, inefficient bike position, a heavy bike, and a far more/heavier gear I don’t know how my knees didn’t explode. On the high end, the 48/11 combo gave 115.2 gear inches. Even with such a tall gear, I remember spinning out on various descents, wishing to be able to pedal to generate some warmth. This entry was posted in Bikepacking, Bikes, Tour Divide on April 13, 2018 by dave.